Body heat harvesting; chemical logic; storing energy in rocks. Chemists at the University of Massachusetts Amherst developed a fabric that can harvest body heat to power small wearable electronics such as activity trackers. The device works on the thermoelectric effect created by body temperature and ambient cooler air. “What we have developed is a way to inexpensively vapor-print biocompatible, flexible and lightweight polymer films made of everyday, abundant materials onto cotton fabrics that have high enough thermoelectric properties to yield fairly high thermal voltage, enough to power a small device,” said Trisha Andrew, a materials chemist at UMass Amherst. Wool and cotton have naturally low heat transport properties, allowing the researchers to create thermoelectric garments that can maintain a temperature gradient across a thermopile, which converts heat to electrical energy even over long periods of continuous wear. It also insures that the conductive material is going to be electrically, mechanically and thermally stable over time. The all-fabric thermopile was created by vapor-printing a conducing polymer known as persistently p-doped poly(3,4-ethylenedioxythiophene) (PEDOT-Cl) onto one tight-weave and one medium-weave form of commercial cotton fabric. The wrist, palm, and upper arms radiated the most heat in volunteers, so the team produced stretchy knitted bands of thermoelectric fabric that can be worn in these areas. To reduce the risk of allergic reaction to PEDOT-Cl, the side that contacts skin is uncoated. 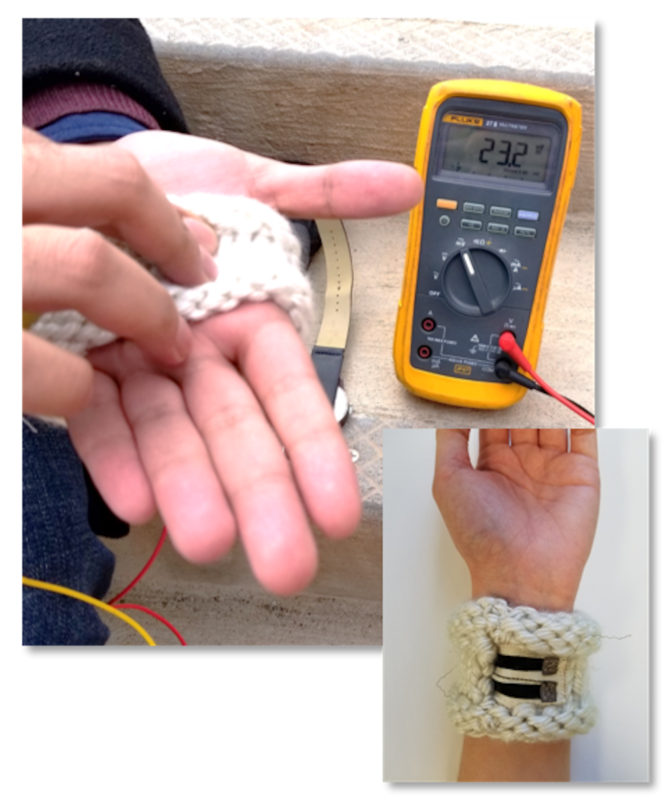 The band generated thermo-voltages greater than 20 milliVolts when worn on the hand. The PEDOT-Cl coating was durable, as well: it didn’t crack, delaminate or mechanically wash away upon being laundered in warm water or abraded. Conductivity remained largely unchanged. The team hopes the work will be useful for smart garments and other wearable electronics. Engineers at the University of Tokyo, RIKEN, and Kitasato University found a way to perform AND logic operations with a chemical device using electric fields and ultraviolet light, a method of computation that could allow for lower power consumption with less heat. The device, which the team says can be manufactured cheaply and easily, features disk and rod-shaped molecules that self-assemble into spiral staircase-like shapes called columnar liquid crystals (CLC) in the right conditions. Before a logic operation begins, the researchers sandwich a sample of CLCs between two glass plates covered in electrodes. Polarized light is passed through the sample to a detector on the other side. In its default state, the CLCs exist in a randomly oriented state which allows the light to reach the detector. When either the electric field or UV light is individually switched on then off, the detected output remains the same. But when the electric field and UV light are switched on together and then off again after about a second, the CLCs line up in a way which blocks the detector from the light. If the “output” states of light and dark, and the “input” states of the electric field and UV light are all assigned binary digits to identify them, then the process has effectively performed a logical AND function, according to the researchers. Geoscientists from the University of Edinburgh and University of Strathclyde suggest that rocks in the North Sea off the UK coast could provide a long-term storage option for renewable energy. Storing renewable energy for times when it can’t be generated is a major issue facing deployment of green power. The process, called compressed air energy storage (CAES), would make use of energy generated from renewable sources to power a motor that generates compressed air. This air would be stored at high pressure in the porous sandstone formations found in the North Sea, using a deep well drilled into the rock. During times of energy shortage, the pressurized air would be released from the well, powering a turbine to generate electricity that is fed into the grid. A similar process storing air in deep salt caverns has been used at sites in Germany and the US. Based on modeling, the researchers say the porous rocks beneath UK waters could store about one and a half times the UK’s typical electricity demand for January and February. The process isn’t perfect. There is some energy loss, with a roundtrip energy efficiency of 54–59%. It is also an expensive option, costing in the range of US$0.42–4.71 kWh−1. However, the team says that locating wells close to sources of renewable energy, such as offshore wind turbines, would make the process more efficient, cheaper and reduce the amount of undersea cables required. More research could help bring down costs.